This Saint lived during the reign of Saint Constantine the Great, and reposed in 330, As a young man, he desired to espouse the solitary life. He made a pilgrimage to the holy city Jerusalem, where he found a place to withdraw to devote himself to prayer. It was made known to him, however, that this was not the will of God for him, but that he should return to his homeland to be a cause of salvation for many. He returned to Myra, and was ordained bishop. He became known for his abundant mercy, providing for the poor and needy, and delivering those who had been unjustly accused. No less was he known for his zeal for the truth. He was present at the First Ecumenical Council of the 318 Fathers at Nicaea in 325; upon hearing the blasphemies that Arius brazenly uttered against the Son of God, Saint Nicholas struck him on the face. Since the canons of the Church forbid the clergy to strike any man at all, his fellow bishops were in perplexity what disciplinary action was to be taken against this hierarch whom all revered. In the night our Lord Jesus Christ and our Lady Theotokos appeared to certain of the bishops, informing them that no action was to be taken against him, since he had acted not out of passion, but extreme love and piety. The Dismissal Hymn for holy hierarchs, The truth of things hath revealed thee to thy flock … was written originally for Saint Nicholas. He is the patron of all travellers, and of sea-farers in particular; he is one of the best known and best loved Saints of all time. Saintly One, (St Nicholas) in Myra you proved yourself a priest; for in fulfilling the Gospel of Christ, venerable One, you laid down your life for your people and saved the innocent from death. For this you were sanctified as One learned in divine grace. Santa Claus or Saint Nicholas? The true story of Santa Claus starts with Saint Nicholas, the bishop of Myra, in Lycia. Saint Nicholas became famous all over the world with his generosity to those in need, his love for children, as well as his care for sailors. 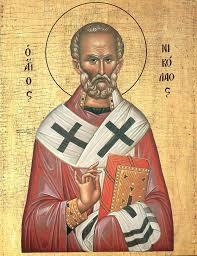 Over the ages many stories and legends have been told about the life and deeds of Saint Nicholas. These accounts help us understand his extraordinary character and why he is so loved and venerated as a protector and helper of those who need him. An account mentions a poor man who had three daughters. In those days, the father of a young girl had to give his future son-in-law something valuable, a dowry. The bigger the dowry was, the greater the chance that the maiden would find a good husband. Without a dowry, it was less likely that a girl would get married. In order to obtain money for the dowry, the father decided to lead the girls into prostitution. But Saint Nicholas prevented this from happening, leaving in their home three pouches with golden coins. The pouches with money, thrown through an open window, are said to have landed in the shoes that were left to dry in front of the fire. This event led to the children’s custom to put shoes at the door and impatiently wait for gifts from Saint Nicholas. Over the centuries, Saint Nicholas continued to be venerated by Orthodox Christians and Roman Catholics, as well as being honoured by Protestants. With his example of generosity, shown to those in need, especially children, Saint Nicholas continues to be a role model for living a life full of compassion. But how did Saint Nicholas become an American symbol of the happy celebrations and the commercial activity surrounding the Christmas Holidays? The name “Santa Claus” is an American version of the Dutch word “Sinterklaas”, an abridged form of “Sint Nikolaas” (Saint Nicholas). In Western European countries, which sent colonists on the land beyond the Atlantic, the cult of Saint Nicholas was the most widespread cult related to a nonbiblical saint before the Reformation. Studies show that there were 2,000 churches dedicated to him in Germany, France and the Netherlands before 1500. It was to be expected that such a popular figure would be also brought to America, as it happened. The inhabitants of the American lands began popularizing the feast of Saint Nicholas, as an occasion to exchange gifts, ever since the 18th century, but without any commercial interests. However, the commercial aspect of this feast was soon taking hold and the name of the saint gradually turned into Santa Claus. In the 1820’s, the saint also received his well-known traits: the reindeers, the sleigh, the bells. In fact, all of these are part of the reality of the world in which he was born. In that period, the sleigh was used as the main means of transport in New York. Clement Clarke Moore, a New York professor of Oriental and Greek Literature, had an idea which would revolutionize American Christmas. In 1822, he wrote a poem with 56 verses, which he titled “A visit from Saint Nicholas”, famous today as “The night before Christmas”. With this poem, almost by himself, he created the modern American image of Christmas. Moore also gave the protagonist of his poem a new appearance: he did not represent him as a bishop, but as a small and joyful elf, dressed in animal hides, smoking a pipe and carrying a sack full of toys on his back. Moore also gave him a sledge, with which he flew through the air, and pulled not by horses, but by eight reindeers, each with its own name. But Moore only marked the beginning of Santa Claus’ journey, as we know him. For a century he was portrayed by tens of artists, in a large variety of styles, positions and colours, until when, in 1920, the standard image of the American Santa Clause took shape, that of a fat man dressed in red. The globally established image of Santa was the creation of Haddon Sundblom, who created it for Coca Cola. Using himself as a model, he led a very successful publicity campaign for the beverage company, popularizing and definitely establishing the image of Santa Claus as a symbol of contemporary commercial culture. All these elements took shape around the figure of Santa, becoming more and more associated with commercialism. This is well understood, given the institutions that promoted this image, however the final result is a complete distortion of the original. Saint Nicholas was a symbol of charity, whereas Santa Claus is an unusual mixture of philanthropism and aggressive commercialism. Saint Nicholas helped people whenever they needed help. On the other hand, making gifts only for the sake of offering our loved ones something that they already have is not in tune with Saint Nicholas’ charitable deeds. In the United States of America, the birthplace of the already exagerated figure of Santa Claus, there is growing interest in recovering the original Saint, so as to contribute to the reestablishing of the spiritual dimension of the festive time of Christmas. This is because, in fact, Saint Nicholas, who loved the poor and took care of the children, is a role model for a Christian way of life. A bishop, Nicholas placed Jesus Christ at the centre of his entire existence. In the same way, we too must not forget that the centre of this Holiday Season that awaits us is no one other than Christ, Who is born for us in the manger in Bethlehem.